Who Is Camilla Thurlow, Prince Harry's New Girlfriend? Old Mo: For most countries, truce means peace, but for Angola, truce means terror! 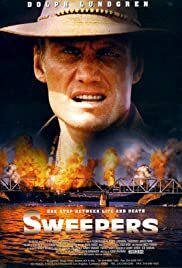 Dolph Lundgren in a Ken Loach drama about a group of male council flat floor sweepers facing prejudice and taunts off the sexist,narrow minded women employees on the estate.Something sound wrong here? It should do. No,old Dolph once again reprises his everyday,tearandwear action man role,this time as a former landmines specialist turned down-and-out fist fighter,whose services are called on to sort out a major new killer mine,being deactivated ,in his place of spiritual demotivation,along the way bumping into his old doctor buddy,Passenger 57 baddie Bruce Payne. There's some added British metaphors (mention of Princess Diana,local lads playing football)and midway through,Dolph makes a bizarre change from an Indiana Jones alike adventurer into an Arnie-Commando esque train dweller.At one stage,he even has to swim under a small wad of water,just like a Dolph-in. Tee hee hee.